A motion calling for a referendum on USI membership failed in DIT on Thursday, despite support from the union’s leadership. DITSU President Boni Odoemene speaking at council on Thursday night. A bid by senior officers in Dublin Institute of Technology Students’ Union (DITSU) to hold a referendum on membership of the Union of Students in Ireland (USI) failed on Thursday night, after a vote of the students’ union council. The vote on Thursday saw USI representatives heckled and an unusual closed-door meeting called. In the meeting, DITSU President Boni Odoemene asked students to support a referendum. Under the DITSU constitution, 51 councillors were required to support a motion calling for the union to hold a referendum on membership of the national union. However, only 41 students voted in favour of a referendum, with 19 voting against, in a secret ballot. The vote followed a tense meeting of the students’ union council. While Odoemene remained largely silent throughout, offering little indication of his own stance on USI, it was at the private session at which he urged councillors to support a referendum on USI membership, according to one student, familiar with the discussion at the private session and speaking on condition of anonymity. They said Odoemene spoke for 10 minutes about why DITSU should leave USI, with the chair and the clerk of council trying to get Odoemene to end the session. The atmosphere at the meeting, they said, was “tense”, with discussion “quick and one sided”. DITSU council voted – for the first time since 2011 – to hold an emergency private members sitting, where only members of council would be allowed to attend and no minutes would be taken. The University Times journalists, USI representatives and the chair and clerk of DITSU council remained outside the meeting for 25 minutes while this took place. Thursday’s vote was a pyrrhic victory for USI. The national union feared it might have to fight a referendum in early 2018, less than two years after winning a victory in DIT. Speaking to The University Times after the vote, USI President Michael Kerrigan said it was a “a positive that the voice of the 91 per cent of students who voted to remain will be upheld”. “However, the majority of people in the room voted for another referendum. It was procedure that stopped another referendum happening, but it is clear we have more work to do in engaging DIT students”, he said. While Kerrigan was invited to attend the council to give an update on the work USI has been doing, he used his five-minute speech to defend USI to a council that appeared largely hostile. Students openly mocked his answers, while there were numerous pointed questions on the purpose of USI. Speaking to The University Times after Thursday night’s vote, Odoemene said he was “disappointed” with the result, but “happy the students made the choice in this way”. It was an “open discussion for council”, he said. Responding to criticisms that USI has not done enough work on the Technological Universities Bill, Kerrigan said that “it is an insult” to suggest this and condemned DITSU’s hiring of a lobbyist to work on the bill separately to USI. “The issue was never about whether we were for or against USI. The issue was about whether the decision that was made last year was made fairly”, Odoemene told The University Times. But Odoemene has always had a tempestuous relationship with USI. A former member of USI officer board, speaking to The University Times on the condition of anonymity because they still hold positions in students’ unions, said Odoemene would often be taken to task by fellow students’ unions presidents in meetings. In these meetings, they said, Odoemene would often focus on work in DITSU, rather than in USI. Speaking to The University Times, a former student with knowledge of the DITSU executive’s attitude to USI, speaking on the condition of anonymity because the knowledge was gained from private conversations with senior DITSU representatives, said Odoemene doesn’t like people dictating to him when he’s in a position of power. They said Odoemene’s antagonism to USI came from a perception that he wasn’t taken seriously by other students’ union presidents. Thursday’s council wasn’t Kerrigan’s first appearance before DITSU council. At the last meeting on November 9th, Kerrigan was grilled on the benefits of USI to DIT students, while in October, the USI Vice President for the Dublin Region, Aisling Cusack, also faced a frosty reception when she spoke at council. Speaking to The University Times, Kerrigan said Odoemene claimed that it was at this council that he had first heard about a proposed referendum to leave USI. 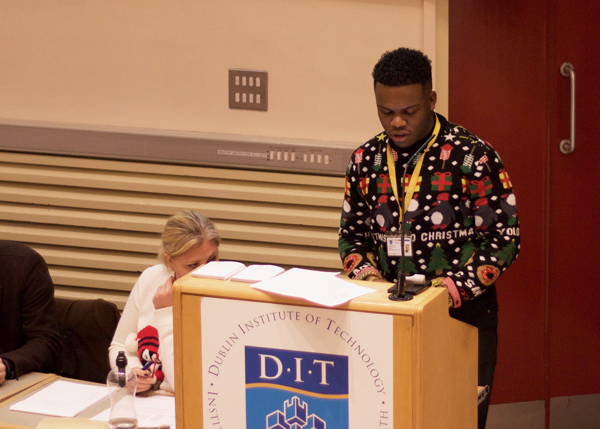 However, speaking to The University Times, class representative Jojo Ní Bheaglaoich said that Odoemene discussed a planned effort to bring a referendum at a class rep meeting on November 8th. Odoemene, she said, often fails to defend USI when it’s criticised at DITSU council. When Kerrigan raised the suggestion that questions were being planted in the audience, Odoemene could be seen chuckling behind him. Speaking to The University Times, Lina Scalzo, the DITSU officer in Grangegorman last year, said at executive officer meetings that Odoemene would ask the clerk to leave the room during discussions about USI so no minutes could be taken. At these meetings, Odoemene would then criticise USI. Odoemene, she said, was “always negative” about USI. Kerrigan has worked this year to expand USI, extending olive branches to non-member students’ unions, such as University of Limerick Students’ Union and University College Dublin Students’ Union. The Technological Universities Bill – which USI is also currently lobbying on – has dominated student politics in DITSU in recent months. The prospect of a merger with the Institute of Technology Tallaght and Institute of Technology Blanchardstown is now looming on the horizon, raising the possibility of another referendum on USI membership after the three institutions amalgamate in the coming years. Both Institute of Technology Tallaght Students’ Union (ITTSU) and Institute of Blanchardstown Students’ Union distanced themselves from any vote on USI membership. Speaking to The University Times today, ITTSU President Jason Kavanagh said it wasn’t his place to comment on referendums in other students’ unions. On Thursday, ITTSU voted overwhelmingly to remain in USI. Last March, 91 per cent of voters opted to remain in USI in a referendum brought under DIT’s constitution, which mandates the union to regularly re-hold a referendum on the its affiliation with USI every three years. The referendum saw 3,328 votes cast. Most students’ unions around the country are members of USI, including Trinity College Dublin Students’ Union. Two years ago, UCD voted in a referendum to reaffirm its non-membership of USI. Dominic McGrath and Eleanor O’Mahony were reporting from Dublin Institute of Technology’s Bolton St campus.